In a sport with a challenging double hump learning curve, the first challenge is to achieve a credible level of consistency. Then, to aspire higher to a station of true excellence, one must scrutinze their fundamental skills even further to scale the steeper second tier. The absolute beauty of tennis is its inherent adaptability. There is no right or wrong way to play it! 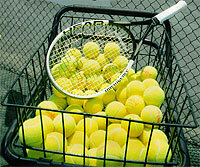 And, one can continue to improve their overall skills as long as they continue to play, well into age group tennis. Simply put, there is only Efficient vs. Inefficient play. The best approach to playing the game is staying true to what is most natural, innate and comfortable to the inner athelete...your own signature game. Enabling motivated individuals at any level, of any age, to acquire the core fundamentals--both below and above the neck--without stifling one's potential for continued growth and evolution is key towards stimulating their desire to become better players... and it's never too late to learn new tricks. Shot-Making - skill with the racket-on-ball in every phase of the game. Physical - footwork and overall agility in defending the court and setting up for balanced shots. Mental - sorting out solutions that sustain success or manage adversity, both strategically and tactically. Emotional - exuding a cool, calm and collected demeanor while simultaneously distancing oneself from the ever present, judgemental, over thinking alter ego...you gotta fight right. Still need convincing that improvement is always possible? Look no further than Hall of Famer Jimmy Connors who, at nearly 46 years young and headlining the '98 Nuveen Senior Tour, said, "I think I can strike the ball better now than I could fifteen years ago. And I think I anticipate better than I did in the past. Or, on a more contemporary note, James Blake, who, if you've read his recent book Breaking Back or know his story, has overcome all sorts of adversity on and off the court by crediting his commitment to the mantra that he and his coach first prioritized when Blake was a young boy - getting better. "Don't worry about winning every match or about your ranking - just worry about getting better. Getting better was, and always would be, the goal." "Perfection is not achievable, it can only be pursued."